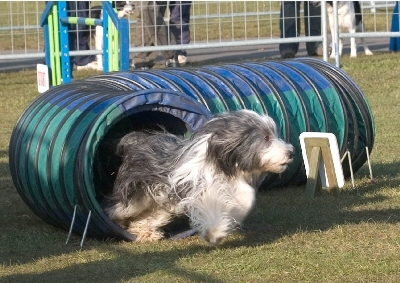 Suzanne Morrison came up with the idea for a Bearded Collie Agility League about when talking to other Beardie owners around the Agility circuit. Wouldn't it be great, they said, if their breed had it's own league table! 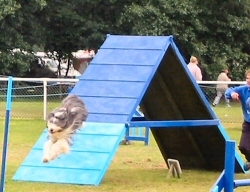 As a result, she ended up taking on the task, and thus the Bearded Collie Agility League was born. The BCA League is open to all Beardies, Working Beardies and Beardie crosses. Working type Beardies and Beardie crosses. The Winner of Group 2 and Best Overall Beardie is Traymak’s Blue (Blue) and the winner of Group 1 is Sulynbourne Mischief Maker (Mischief). The Best Veteran is Herbal Remedy (Cedar). Congratulations to the winners. 1. Open to all Bearded Collies, Working Bearded Collies and Bearded Collie Crosses. 2. The league shall run from the 1st January until 31st December 2008. 2 – ‘Working’ type Beardies and Beardie crosses. 5. Dogs will accumulate points in the grade they are in on the 1st January 2008. 6. Dogs over 8 years on the 1st January can accumulate points in their grade OR in veteran. 7. Points can be collected from Kennel Club open and limited shows and Independent shows. All scheduled classes count towards the league except knockout, pairs, trios and teams. Pay on the day classes do not count. Classes for which you have competed in a qualifying round, where league points have already been gained in that qualifier do not count. 8. In all levels the points for more than one dog cannot be added together. 9. The League is concerned with the dogs achievements; therefore you can still claim points even if run by a different handler. 10. Points to be awarded 32 for 1st to 3 for 30th, 2 points for a clear round. Points are only awarded for places if a rosette is actually awarded. Points are only awarded for clear rounds within the course time. 11. Trophies for best in group 1 & 2 at each grade, trophy for overall winner in each group and a perpetual trophy for overall top Beardie. 12. Please ensure that points are submitted no later than 3 months after the show (in order to give a fair picture of how the league is progressing). All points must be in by 31st January 2009. 13. Cost for entry to the league for first dog will be £2.50 per year and £2 for each additional dog.